Great customer service! Really pleased with this app and it's a whole lot cheaper than WW :). It just keeps getting better and better. Thanks guys! It works great on my iPhone!! How do you track your food??? I have used the free version this app for several years and really like it. I recently switched to the premium (paid)version because I liked the WW online app but not the cost. This app can be purchased either monthly or pay for the entire year for the same cost as one month in WW online. It takes a little bit of time to set up but is easy to use and It allows fitness points to swap for daily points also. I am very pleased. Love this app. Helps me stay on track by staying accountable. I hate calorie counting and enjoy eating healthy foods. This reminds me to eat healthy as the counting is geared in favor of healthy eating! Not only is the layout bad but when you change the servings the points don’t change. Waste of money. I was using the standard subscription (free; no cost) and everything was fine but I wasn’t losing weight fast enough so thought I would upgrade to premium. What a mistake that was. I was charged $17.99 for one year and you get absolutely nothing more than the standard free subscription. And because I joined using my Apple phone through iTunes the only way to get a refund is to go through iTunes and “Report a problem” and hope you get a refund. I think these people who wrote this app or taking advantage of people and making a lot of money. Just use the free subscription and don’t pay premium!!! Great tool , great price. I used this tool several years ago and lost about 30 lbs. Sadly I became lazy and gained much back. At it again though and really like this program better then the new weight watchers program. And much cheaper. A great little app if you still use the Weight Watchers Points Plus from 2012! But do not use your real email to sign up for the community. They sell it to 3rd party spammers, I think, bc I started getting junk almost immediately. And the community is down, anyway. this is a great app. it great that it tracks ur weight. one promblem is when u search for food, its very confusing and im sure sone of the points compared to the books are wroung. for ex. diffrent points for the same food. I purchased the Premium. I go to enter my Unsweetened Cashew milk and you can adjust the amounts. Only a cup and I need to change it to 2/3 cup. If I knew you could adjust food amounts I never would have spent my money. This app has allowed me to follow the plan (Points Plus) that worked for me and for free!!!!!! Very robust app. My only constructive criticism is Id like to see the navigation be a little more intuitive (and perhaps prettier). It takes me a while sometimes to find what Im looking for but theres a lot of functionality in here! Love that i can reset specific modules like just the weight tracker (makes tracking clearer when you go off and on again hehe). No doubt Id gain all my weight right back if it werent for this app. Its a Godsend!! I recommend it all the time!!! 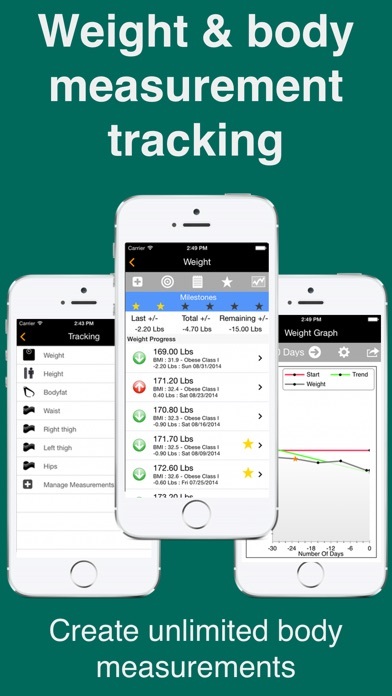 Great app and a great way to follow the old WW program that worked for me! I paid for the premium service but my account never updated. The database is very limited. The app doesn’t sync between devices. For the price it is okay. Not as user friendly as WeightWatchers. I have struggled with Smart Points since it came out and now have found myself binging again, which I thought I had conquered long ago. Smart Points is so restrictive that it sets off a binge in me for some reason. So grateful to have access to the old Points Plus program where I can eat what I want but yet still get my veggies and fruits in. You can still follow Smart Points on this program, but I prefer Points Plus. So glad to have a choice! Developers keep adding improvements which makes this program easy to use and a pleasure to work with. I highly recommend this program. I wish I could buy the product in full without having to pay for the premium features. That being said, it’s the best one out there. I have done WW in the past and had great success. I am now on a fixed income and was looking for a way to continue on my weight loss journey. This app is perfect. I have lost 28 pounds in 5 months, slow but sure. I don’t feel deprived and treat myself occasionally to things I don’t normally eat but track them and move on. The carry over plan gives you EVERYTHING that a high price plan charges 21.95 per month for their app. Sure they charge you, but at 1.99 per month what an outstanding deal. The only negative I have come across is how you can’t move blocks of food to your diary. My fitness pal can’t accommodate the new freestyle program but this has mastered it. I am used to WW so it's taking time to get used to this app but so far I like it a lot. Love this app! I have used it for 3 years works great for me, lost 50 lbs and so far keeping it off. I would like it better if I could add more than one exercise at a time or lump several into one workout routine like you can for a meal. 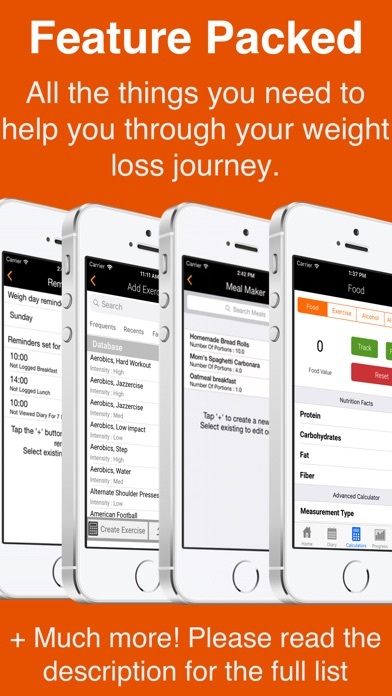 Works as well if not even a bit better than the weight watchers app! Much cheaper too!! This app works great for Catalina points I tried a few different apps this one is the best. The only thing that I personally would like a prude is the scanning of food items. I wish the app would calculate the points based on the program that I’m using and not just a general. So I’m on the flex plan or roll over if she calculate a can of beans at zero! Great tool to manage diet and weight. I’ve been using this for years to manage my diet and progress. It’s always on the home page of my phone and one of the top apps I use. It works great and well worth the cost. It is only after I paid $2.99 to purchase the app that I found out that I had to pay extra to get the program I wanted since there are different ones. I will not pay extra since I was not informed of this before the purchase. I consider that I have been RIPPed OFF of $2.99. I’ve been sitting here reading reviews and it’s funny about some of the negative ones. It’s all about the pts not being correct. But in other apps it’s all based on others (the app users) numbers as well. Use the calculator and stop being lazy! I also google things a lot as well to make sure I have the correct pts. I love this app! It’s helped me to adopt a better lifestyle and be healthy! I refuse to be lazy because that’s what made me fat in the first place. Please please please never go away because I NEED this app and what it stands for! You guys are doing a great job! Love it! I am using regular ultimate value diary which is fine. Wish there was a way to opt out of social media portion. I am not a member of ultimate value diary plus as I did not want to pay extra for it. This app is great for using WW old points plus. I am a ww lifetime member and used their product extensively. Thsnk you for upgrading your product. I bought again. Missed information regarding pricing. Paid $2.99 for app with the understanding that smart points and freestyle program were included as well as Fitbit activity integration. This is not the case: instead $2.99 gets you the old Points Plus Program. $17.99/year is necessary to add these advertised features. Just paid for an app I didn’t need because of lack of up front product details. I've lost 5 lbs so far and I believe I've lost more because I have to keep pulling my uniform pants up when I'm at work. My weight is funny like that,..it doesn't all show up on the scale immediately. This app makes keeping track of points not seem so much of a chore. I love it. Down 100 lbs thanks to this app! In just under 9 months, I’ve been able to lose 100 lbs thanks to tracking points. This app has been so helpful to allow me access to the WW database without having to pay an arm and a leg each month. Thank you for providing a tool to get my life back! I have been using your app for years now. It is so user-friendly and by far the best app of it’s kind. I just heard of the release of the new WW program today. I would be over the moon with excitement if you are planning on adding this plan option for us!! Love the update with the new freestyle plan, thanks for keeping it awesome ! I bought the super low cost subscription to sync my fitbit and backup my data, well worth the price - recommend. Makes Points Plus so easy GET IT! Excellent app! GET IT! Very user friendly app. I love the bar code scanner feature! So many other great features to help me track my food points, my healthy choices and my progress! It's genius! Best of all I am motivated and feel rewarded by using this app! Points Plus is included and that's what I prefer, but Smart Points is available with a subscription. This app is worth every penny. Just buy it! And good luck with your weight loss :-D Dec 31, 2017 Addendum Used this app on my iPhone for entire past year successfully losing weight and hitting my goals using Points Plus, a weigh-in buddy and support through this app's community. For this next year 2018, I decided to purchase premium subscription and try the new carry over program (Freestyle/Flex) using Smart Points. Already losing even over the holidays! One of my best app purchases ever. Thank you! I have been a member of Weight Watchers for years. Now retired, I really didn’t want to obligate myself to a fee. I just add the bar code of foods I eat often, put them under favorites, and then quickly track them. I like the restaurant database also. 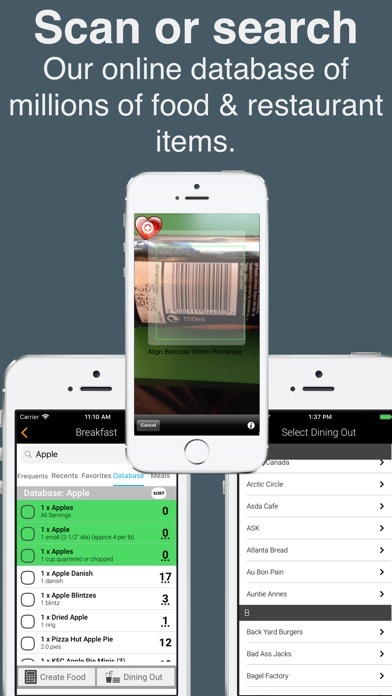 It allows you to quickly track those meals. A nice all around app. App runs very slow. Their database works slow. Getting to help really. They tell me they do this in their spare time! I’m paying for premium and their data base is a joke. Their excuse is it’s customer controlled. I see an item with as many as 4 values. Really which one should you pick. If I have to enter myself why am I paying premium. Good example of a well written app NOT MANAGED. I don’t believe that the dining out guide is updated. There are several entries on different restaurants that aren’t being served anymore. I was led to believe that by purchasing a premium plan I would be able to track Weight Watcher’s Freestyle points. Very few points match the actual Weight Watcher’s Freestyle points. I went back to Weight Watchers because this app is useless. I contacted Ultimate Food Diary and they said they do not claim to be a Weight Watchers tracking app. Then what are they??? Do not waste your money!! *Update: The developer is stating that my review is not genuine. It is very genuine! The points on this app in no way align to Weight Watchers Freestyle program. It may work for others, but when every point counts toward weight loss success, this program can sabotage your weight loss plan. The meal planner is also not accurate. I asked for a partial refund for the app in October because I was out of the country for a month and did not use it after I purchased it. I went back to the Weight Watchers app and have had much better success. **update: My reviews are not threats as suggested by the developer. I understand I cannot get a refund because I should have tried the app sooner, so that is my own fault. My reviews are to prevent others from making the same mistake I did. This is my only review. I feel the developer is harassing me now to avoid others from believing the truth. Others have left similar reviews. Please do read all reviews as the developer suggests. I should have read them before purchasing the premium upgrade. 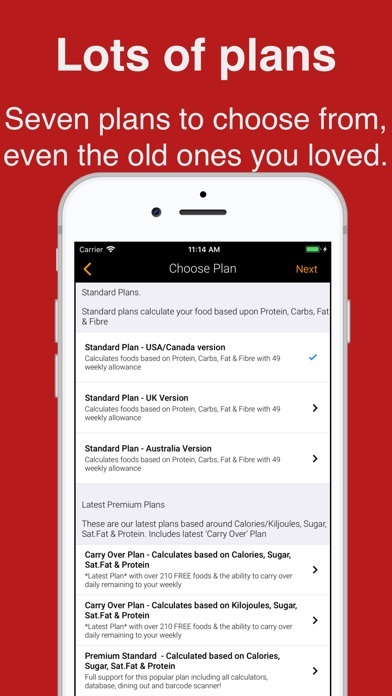 I was hoping for a more simple app with a broad data base for food items. Most things I scan aren’t in there so manual adding is what happens most times. But I think you can at least save your items & point values. Also the customer service was curt with me. Twice. I gave them my money so it bothers me when my questions receive curt answers. I would not buy this app again. I wish I could get a refund. Just not for me. THEEEE BEST app for Points Plus!! This app has everything you need! Extensive food and restaurant lists, meal maker, measurements for your body, bar code scanner...and all of these are free options!! Thank you for all you do for us, this app has literally saved my life. I have been using this for a week now, and I love it! It is very easy to use once you spend some time learning it. I know that I will be able to lose the weight I need to lose. I was using WW, and this is so much the better bargain! Less than $18 for the entire year! That is less than 1 month on the WW app. Great job guys! I was led to believe that by purchasing a premium plan I would be able to track Weight Watcher’s Freestyle points. Very few points match the actual Weight Watcher’s Freestyle points. I went back to Weight Watchers because this app is useless. 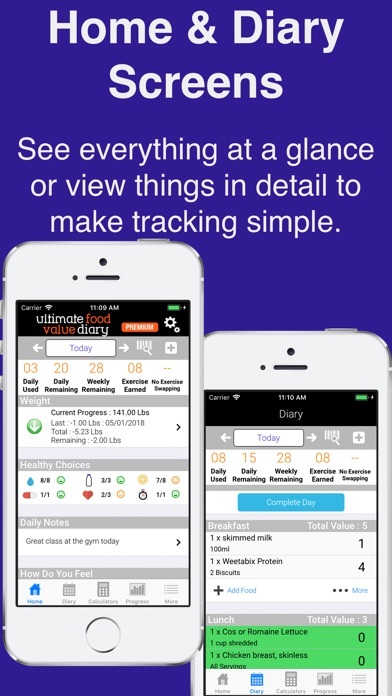 I contacted Ultimate Food Diary and they said they do not claim to be a Weight Watchers tracking app. Then what are they??? Do not waste your money!! It needs to support the Garman watch series FENIX for the pedometer part. You are amazing! You have everything I need to keep doing Smartpoints! I was skeptical about replacing another app that I’ve used for years. But this one is a great replacement and it has all the features of the other one. And the price! I really like that I can choose which plan I want to use. Diet companies should get a clue that people want choice and economy. Just as good as weight watchers. It does not automatically sync between all devices. Come on! This is 2018. Who has time to do backups and restores and worry about which device has the most recent entries?? Very disappointed because this app came highly recommended. The best thing about this app is it’s very user friendly and if I can figure it out anyone can! Right at the beginning of signing in I found out I had to sign up for their “program” to get the latest plan. What???? No thank you and I want my money back. You can keep your app!!!! This is a great app. I haven’t like WW since they got rid of Points Plus but did great on that program. Now I can still do the PP plan with this app. You can also hook up your Fitbit for activity points. Totally worth the premium price which is still much cheaper than WW!